The best doctor’s recommendations or nutritional consulting for ARMD are fruitless unless nutrients are able to be broken down or micellized, transported to the macula, and assimilated there. After years of observing how some patients prevent ARMD despite strong hereditary tendencies, how some halt or even reverse impending blindness, and how some patients actually get worse despite being on the same protocol, it became clear that powerful tactics were needed in addition to recommending dietary changes or supplements. The strategies we employ are successful for many individuals and have applications far beyond the diagnosis of ARMD. They will influence conditions or diseases where proper fat breakdown is essential to impact issues such as dry eye, post-cholecystectomy (gallbladder surgery) status, liver disease, etc. The eye, GI tract, liver, and gallbladder are intricately entwined. Think about it, when your liver is sick, your eyes turn yellow or jaundiced. When your GI tract is out of balance, red, itching “allergy” eyes often result. Interesting signaling! The solution is more complicated than just popping a supplement or even making some dietary changes. Are you ready to learn the secrets? Whether you have macular degeneration or not, these concepts will serve you well. Some doctors, when pressed if they had only one system to specialize in, would tell you, “The GI tract.” Why? Because the GI tract is central to good health and its ability to affect the entire body so powerful when operating at its peak. It is here that we begin to improve vision. The target nutrients used in past studies to prevent, halt, or reverse ARMD are lutein, zeaxanthin, beta-carotene, antioxidants, and fish oil. The carotenoids (lutein, zeaxanthin, and beta-carotene) concentrate in the central part of the retina, and help us identify colors and see fine details, so they are vital in a healing strategy. They also provide protection against blue light, which damages the retina. 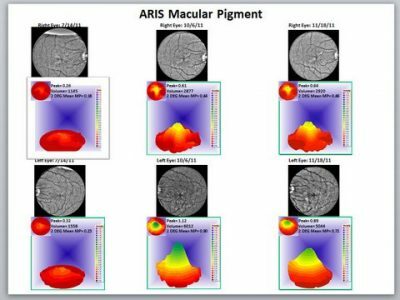 Building macular optical pigment density (MOPD) is the goal in this approach, replenishing the macula; but first we have to break down these carotenoids and antioxidants and then shuttle them to the macula by following several simple tactics. Dr. Stuart Richer, who demonstrated success in reversing macular degeneration with the LAST studies, shares an encouraging increase in MOPD in the pictures below. From July 14, 2011, to October 6, 2011, the degree of MOPD increased by employing some of the following strategies. A picture is worth a thousand words and is the tool best used to motivate patients to committed action. These pictures give hope to those losing their eyesight; the macula is refilling nicely with lutein and zeaxanthin. The graphs show MOPD, at baseline on the left and increasing in the right-hand picture reflected by the non-red portions of the image after nearly three months of supplementation use. This means the macula is refilling with lutein and zeaxanthin. To ensure proper breakdown of supplements, use a good digestive supplement, preferably one that contains ox bile, taurine, lecithin, and adequate hydrochloric acid, or a combination of these. Thinning the bile is a major key to eye health as it will help more lutein get to the macula. Doing a liver/gallbladder flush seasonally is an aggressive part of the plan, if one wishes to take a serious, logical approach. Remember, the liver and gallbladder influence the eye, so aim to create a healthy, fully functioning liver and gallbladder. We are not only our eyes. We are a complete system, so thinking from a systems biology approach may create the desired healing response. To do this, head south to the GI tract first. A well-functioning GI tract influences the eye tremendously. Support digestive ability by following the 4-R or GI Restoration program. Absorption of the macula-replenishing carotenoids like beta-carotene will be hindered by the presence of Helicobacter pylori bacteria and/or an imbalance of intestinal bacteria. This interior terrain needs a healthy balance of good bacteria versus bad bacteria by using targeted supplements and the support of digestive enzymes along with the other approaches discussed in the 4-R protocol. All of the targeted supplements and carotenoid-rich foods we suggest will not do you a bit of good unless they are first broken down or micellized. These are the micellizing “magicians” that get the job done: (1) Ox Bile: Supply exogenous ox bile, particularly to post-cholecystectomy patients; (2) Lecithin: (Sunflower or soy) can be added to the diet to aid in fat breakdown; and (3) Taurine: A precursor to bile production, which also thins bile. 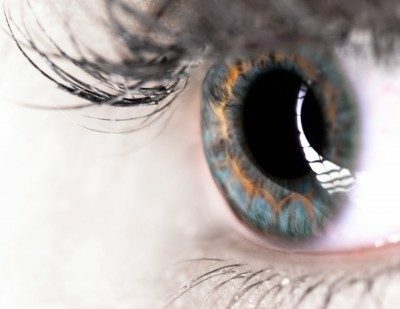 Fat-soluble lutein and zeaxanthin, essential to replenish the macula, require being emulsified or broken down to the micellized state in order to enter the bloodstream for transport by a very surprising particle “shuttle,” high-density lipoprotein (HDL). Bile acids are made from cholesterol in the liver and stored and concentrated in the gallbladder where they act as an emulsifying agent to break up fat into smaller globules, making it more soluble or hydrophilic. This process is called micelle formation. Fat and fat-soluble vitamins like A, D, E, K, beta-carotene, and the carotenoid family are carried to the intestinal mucosa, absorbed into the lymphatic system, and then into the bloodstream. So what is the best kept secret? First, break down the fat-soluble vitamins and then get them to the macula by raising HDL levels to 61 or above. Do you know what your HDL level is? We discovered this secret by observing hundreds of macular-degeneration patients and had noted in their history that many had had their gallbladder removed or else they were obese or otherwise compromised and had trouble digesting fats, as evidenced by their dry skin, dry eyes, weight gain, gas and bloating, or floating or shiny stools after fatty meals had been consumed. The connection was obvious! No gallbladder, fat maldigestion, or liver or GI issues equaled problems. Half a million people a year are opting for cholecystectomy (gallbladder surgery), not realizing that they can simply cleanse the liver and gallbladder with a “flush,” which is basically an “oil change” that removes old, stasis bile and relieves symptoms in most cases. It is not hard or expensive to do and anyone can do it. And it is certainly worth a try. However, we are concerned – particularly in a patient with macular degeneration who has undergone cholecystectomy – that fat-soluble vitamins be effectively broken down and absorbed. It is hoped that practitioners caring for macular-degeneration patients incorporate these strategies into their standard of care so that non-responders will have more chance of improvement. Lutein and zeaxanthin, critical components to replenish the macula, are carried in the bloodstream to the macula on HDL particles. That’s amazing. Carotenoids responsible for central vision hitch a ride on a cholesterol particle and hone in on their destination: the macula. And you thought cholesterol was the enemy … wrong! Cholesterol in a healthy ratio and thin bile are key players in this healthy-eye strategy. Bile is made of bile salts, cholesterol esters, and lecithin. Keep cholesterol at a healthy, total level and at an optimal HDL-to-low density lipoprotein (LDL) ratio because if cholesterol is too low, we will not have enough of the raw materials we need to make bile. Be sure you have what it takes to make cholesterol. Even magnesium plays a part. Blood-serum concentration of lutein and zeaxanthin by proper breakdown of nutrients into micellized globules is important, but equally important is the ability to transport them to their targeted destination. Unless HDL cholesterol is adequate – at least 61 milligrams per deciliter – time and money are potentially wasted on supplements. Exercise: Regular exercise that raises your heart rate for 20 to 30 minutes increases HDL. Lose Weight and stop eating transfats: Carotenoids concentrate in the fat first, so if overweight, lose weight! Meantime, while you’re working on it, take more lutein and zeaxanthin and employ the most successful diet recorded to lose weight and reduce disease: the Hale Project documented the amazing success of the Mediterranean Diet (MeDi). Not only is it a smart way to eat, but it also reduced all causes of death and disease by fifty percent in study participants aged 70-90 with active disease processes established after ten years adherence, practicing moderate red wine consumption, light exercise, and not smoking. Macular degeneration or not, this diet is proven! Drink Red Wine or use Resveratrol: High-altitude or heat-stressed vine wines from Argentina, Chile, Australia, or damp, moldy vines found in areas like the Finger Lakes of New York are typically higher in resveratrol and will not only raise HDL but also influence health at 1-2 glasses per day. If you don’t drink wine or it is contraindicated for you, then use non-alcoholic resveratrol. Take Niacin and Fish Oil: both increase HDL. Quit Smoking: Besides reducing HDL smoking asphyxiates the eye. Get an Oil Change: Remove all transfats from your diet and replace them with healthy, healing oils to raise your HDL. Employ olive oil, coconut oil, ghee, hemp oil, and flax oil. There is strength in combining a multi-pronged approach, so consider employing the total approach. Preventing, halting, and even reversing blindness is worth every sacrifice or new habit employed to ensure success and these secrets are a winning combination. Aim for an HDL of 61 mg/dl. Lose weight, if needed, and take a combination of supplements proven to halt or reverse macular degeneration. If overweight, take more than the recommended amount of carotenoids or use water-soluble zeaxanthin. In either case, employ the MeDi. It extends life and reduces disease. Take a supplement that supports proper fat breakdown along with a good eye vitamin. Do the 4R program and/or a liver/gallbladder flush in the Spring and Fall to improve fat assimilation. Flush and nourish the liver/gallbladder. Eat a preferably organic diet, rich in the carotenoids, to replenish the macular pigment (MOPD –remember the pictures?). Egg yolk, kale, spinach, collard and turnip greens lightly steamed, romaine lettuce, broccoli, Brussels sprouts, red and yellow vegetables, and fruits are all great sources. *A special thanks to Dr. Stuart Richer, Dr. Donald Carroll, NTP, and Bill Sardi, Medical Researcher, for reviewing this article.